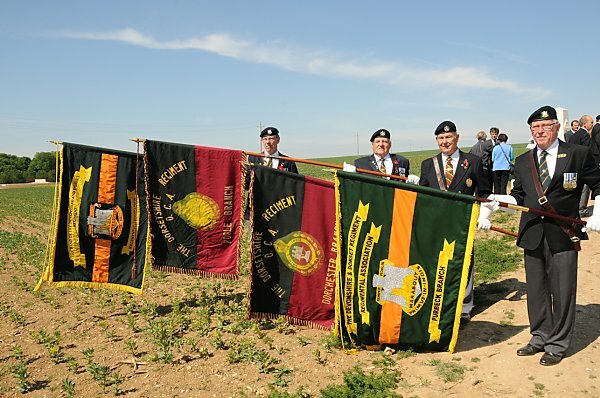 The Service of Dedication of the Dorset Great War Memorial - the project, supported from its very beginning by the Dorset & South Wiltshire Branch of the Western Front Association (WFA) - was held on a brilliant sunny day on Saturday, 7 May 2011 at 11 a.m. close to the Somme village of Authuille. The service, conducted by Reverend Nick Wall MBE TD, was attended by H.M. Lord Lieutenant of Dorset, Mrs Valerie Pitt-Rivers and the President of the Devonshire & Dorsetshire Regiment Old Comrades Association, General Sir John Wilsey GCB CBE DL. Our French hosts were represented by Monsieur le Sous-Préfet, Monsieur le Conseiller Général and Monsieur Regis Schoonheere, Mayor of Authuille. Among the 150 strong congregation were 50 Dorsetshire Regiment Comrades and 15 boys and girls of the Dorset Army Cadet Force, including the Lord Lieutenant's Cadet. Martin and Judy Willoughby, Chairman and Secretary of the Dorset & South Wiltshire WFA, various other supporters of the project and people of the commune of Authuille were also present. 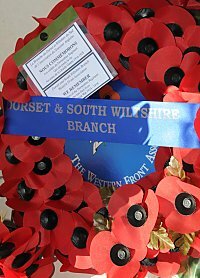 The family of Pte Dobson of the Dorsetshire Regiment killed here on 1 July 1916 and buried in the nearby Lonsdale Cemetery had travelled from Weymouth to be part of the service. The service was filmed and covered by BBC South Today. Major Tim Saunders MBE started the service by giving a short address on the historical background and was followed by the Lord Lieutenant who spoke fluently in French thanking the Authuille people for their kind hospitality and kindness, M. Philippe Drouin (Somme Remembrance Association) for all his help and M. Gamain who had donated the piece of land on which the memorial now stands. She spoke of how this part of rural France was so similar to Dorset and how the horrors of the battle that took place almost 95 years ago cemented our relationship with the French. 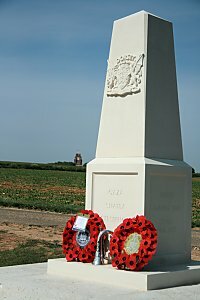 The Lord Lieutenant went on to say that the memorial was for all soldiers of Dorset, the Territorial Force and Yeomanry who fell not just here in France and Flanders but across the world and it was fitting a quotation from Thomas Hardy 'Victory Crowns the Just' was on the memorial. She concluded by saying that this place will forever be a part of Dorset. The Mayor of Authuille replied. Following the Bidding and the Lord's Prayer the congregation sang the hymn 'O God, our help in ages past'. Mr James Crane, a descendant of Pte Samuel Crane of the Dorsetshire Regiment, killed 11 January 1917 read 'A Soldier's Prayer'. The Rev Walls spoke the Dedication Prayer, and the congregation joined together in 'The Commitment'; the Collect of the Regiment was said and then the Blessing. The wreath laying then took place with the Lord Lieutenant and M. le Sous-Prefet laying the first wreaths. The youngest to lay a wreath, and descendants of men who had served in the Regiment, were Reuben (age 7) and Tabitha Burbidge (age 11). In-Pensioner Vic Farminer of the Royal Hospital Chelsea spoke the Exhortation and echoing over the 'old front line' of the Somme battlefields Bugle Major Cox sounded the 'Last Post' signalling the 'Silence' during which the standards of both the Dorset and French Comrades were lowered. Time stood still as the mighty Memorial to the Missing at nearby Thiepval overlooked this most poignant moment of the ceremony. 'Reveille' was sounded and the Rev Walls led the singing of our own National Anthem immediately followed by the rousing French Anthem 'La Marseillaise'. This brought the service to an end. Half an hour later a simple ceremony at Authuille village war memorial took place and again the Lord Lieutenant laid the wreath. All then adjourned to the village hall for the Vin d'Honneur where General Sir John Wilsey thanked the Mayor and presented him with a water colour painting depicting soldiers in uniforms of the Regiment circa 1914; the mayor reciprocated by presenting a gift of wine. Glasses of wine were provided with brioche and a little later a finger buffet provided us all with much needed nourishment. The event then came to a conclusion with the Comrades and Cadets doing a battlefield tour. All agreed that it was a most memorable day and that the memorial we had worked so long for was a fitting one to the 4,500 Dorset men who lay 'in a foreign field'. 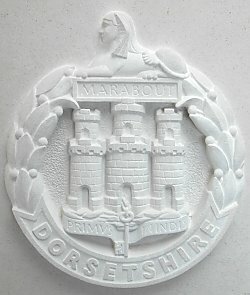 As one Dorset Regiment Comrade poignantly observed following the ceremony "To me, the Dorsetshire Regiment will live forever now"
An article on the development of the Dorset War Memorial can be found under The Dorset War Memorial Takes Shape.